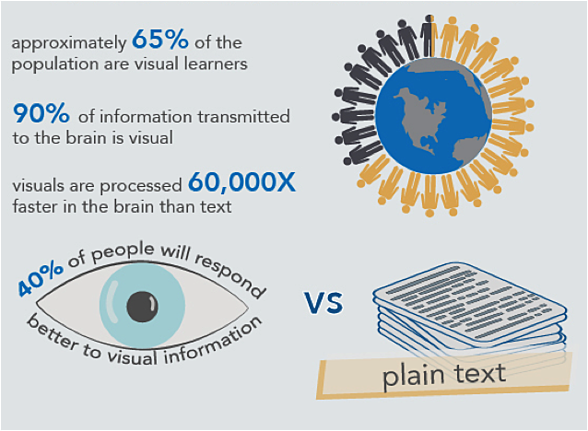 The brain processes visual information 60,000 times faster than it does textual information. 40% of people will respond better to visual information versus plain text. Visual content is attention-grabbing, shareable and emotive. Pair existing marketing efforts with strong visuals to maximize reach and make your content memorable. Below are a few ideas to get started. A dedicated visual campaign centers around content specifically written or created with the intent of a visual asset. These campaigns materialize as videos, infographics, presentations and any other media in which the end results dictates the content’s format. If you’d like to test a dedicated visual campaign, consider creating an explainer or demo video. According to KISSmetrics, “visitors who watch video stay on the site twice as long and visit twice as many pages versus those who don’t see the video.” Video content is engaging and can help potential customers digest the information with little effort on their part. What’s more, creating video doesn’t have to break your budget. Affordable options exist for companies looking to get their feet wet. Sites like VideoHive (@EnvatoMarket) provide professional templates that are easy to customize if you have a multimedia team at your disposal. For those who don’t, consider a service like Wooshii. With Wooshii, you describe your project, budget and goals, then receive proposals from its curated community of videographers and animators. A similar approach can be taken with infographics and other graphic design needs. If you don’t have an internal design team, and outsourcing to an agency is not within your scope, consider sites like 99designs (@99designs) and GraphicRiver. However, nothing beats the creativity and collaboration that transpires when working with a video production partner or creative agency. Dedicated visual campaigns do not have to overtake your marketing agenda. Try to set aside budget and time for at least one campaign per quarter to increase your visibility in priority markets, better connect with buyer personas or improve conversion points. You can also “sprinkle” visual content. This approach mainly takes place on your website, blog and social networks. Image-heavy “listicle” blog posts (made popular by Buzzfeed). 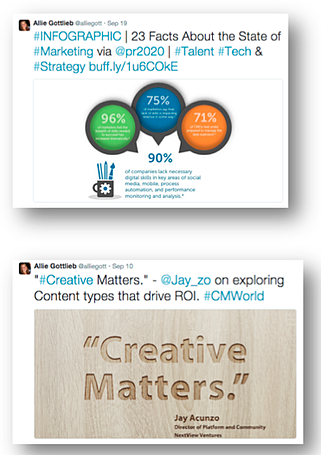 In particular, social network feeds are cluttered with textual content. Help your followers and potential customers see your post by adding a pop of color or an eye-catching visual. This will grab their attention as they scroll and make your post more visible among the clutter. You can partner with an agency or your internal team to create compelling graphics. Alternatively, tools like Canva (@canva) bring amazingly simple design capabilities to everyone, without the need for graphic design software. How does visual content play a role in your marketing campaigns? Share your thoughts in the comments below. 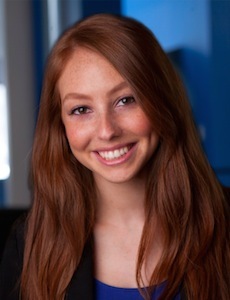 Allie Gottlieb is an associate consultant with PR 20/20. She is a 2013 graduate of the Scripps College of Communication at Ohio University, where she majored in video production. Full bio.